The Florida Public Records Law authorizes the public to inspect, photograph and copy public records maintained by the St. Johns County School District. Public records are records made or received in connection with the District’s official business. However, there are many statutory exemptions from public records disclosure, and some records are statutorily designated as confidential (student information, social security numbers, health care records, etc.). 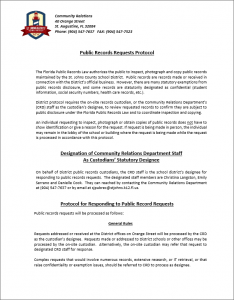 District protocol requires the on – site records custodian, or the Community Relations Department’s (CRD) staff as the custodian’s designee, to review requested records to confirm they are subject to public disclosure under the Florida Public Records Law and to coordinate inspection and copying. Pursuant to the authority granted by School Board Rules 3.12-Public Records and 3.07 – Charges for Copies of Public Records, the Superintendent adopts the following procedures and guidelines for charging fees for extensive public records requests. 1. Background. The District is authorized to charge a reasonable fee for processing a public records request if processing the request will require extensive use of information technology resources or extensive clerical or supervisory assistance in order to properly process the request. Such extensive effort may be required to review the request; formulate and carry out a search for responsive records; retrieve the records; review them to determine if they are responsive; legally evaluate them to determine if they are confidential or exempt; and, if necessary, to redact confidential or exempt material. 2. Fee Basis. The fee will be based on the cost incurred for use of technology resources and the labor cost of staff and attorney time required to process the request. 3. Criteria for Charging Fee. For purpose of Rule 3.07, a public records request shall be deemed to be extensive so as to require imposition of a fee if it is determined that more than one-half (1/2) hour of staff and/or School Board attorney time will be required to properly process the request. District staff time shall be based on the District’s labor cost and its attorney time al the rate of $175/hour. 4. Payment Terms. A deposit in an amount equal to the estimated fee shall be payable in advance. If the actual charges are less than the amount of the deposit, the unexpended balance will be refunded to the requesting party upon completion of the response. If during the process of responding, it is determined that the actual costs incurred will exceed the amount of the deposit, an estimate for the additional fee shall be provided to the requesting party. An amount equal to the estimate for the additional fee shall be paid by the requesting party as a condition to the completion of the response to the records request.